Black Ankle owners Sarah O'Herron and Ed Boyce credit - or blame - their entry into winemaking on "one taste-test too many." The winery is named after the road on which the vineyard sits in Frederick County, Maryland, in the North Central Piedmont region. It may have originated from the muddy boots walkers got when traversing the road that was a dirt trail long after other roads had been improved. It also may date back to Native American lore. They like the "wine stomping" images that spring to mind. Sustainability is a watchword at Black Ankle. They even built their winery and tasting room from "straw, clay, stone and wood that we found on the farm." Sounds like a structure on which all three "little pigs" could have collaborated. 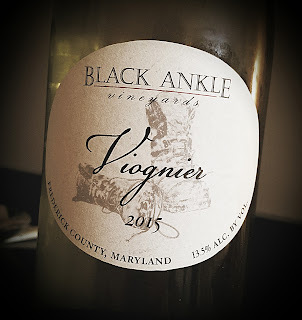 The 2015 Black Ankle Viognier was purchased at a local wine shop in Baltimore’s Fells Point neighborhood, where we stayed on a recent vacation. It blends 75% Viognier and 25% Grüner Veltliner in a mix that I don't think I've encountered before. 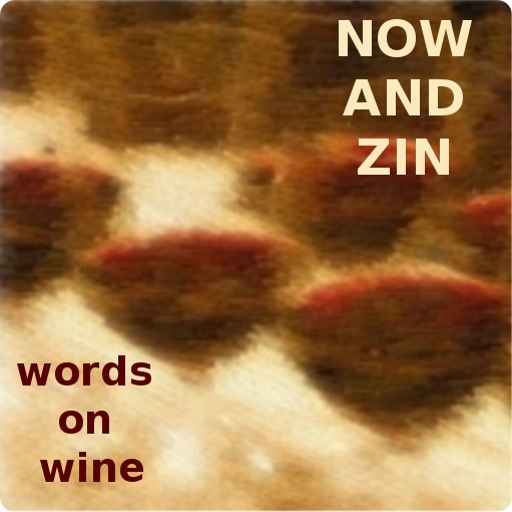 The vines grown in what the winery calls "decomposing slate with quartzite veins." It retails for $32, although I got mine several dollars cheaper. Alcohol is at 13.5% abv. Pale yellow in the glass, this Maryland Viognier has a delightful nose of peaches and lemons. The palate shows a savory sense with both wonderful acidity and a full mouthfeel. White wines are enjoyable enough when the weather is perfect, but when things are hot and humid there’s an even higher appreciation achieved.